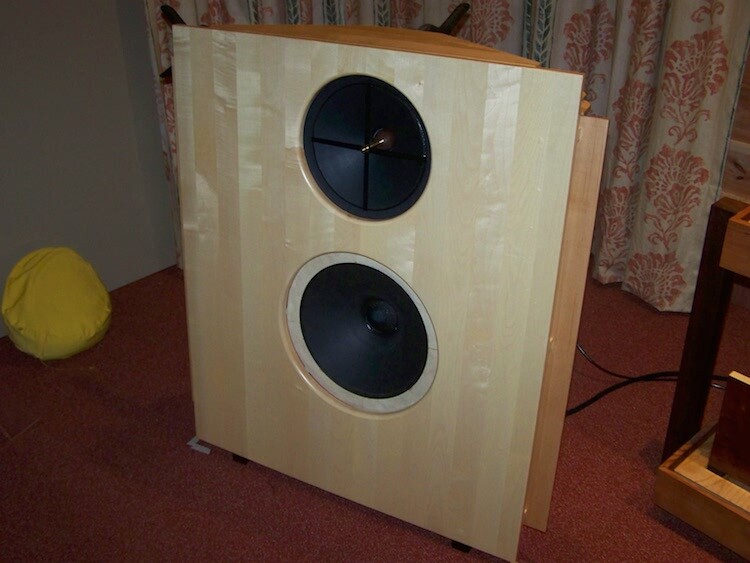 Lately I visited the listening room of Musical Affairs to look and listen to the newly developed Open Baffle speakers equipped with Pel Audio modified EMS fieldcoil speakers. Musical Affairs equals to Hans Kortenbach and he works in close companionship with Pel Audio, being Cees Pel. 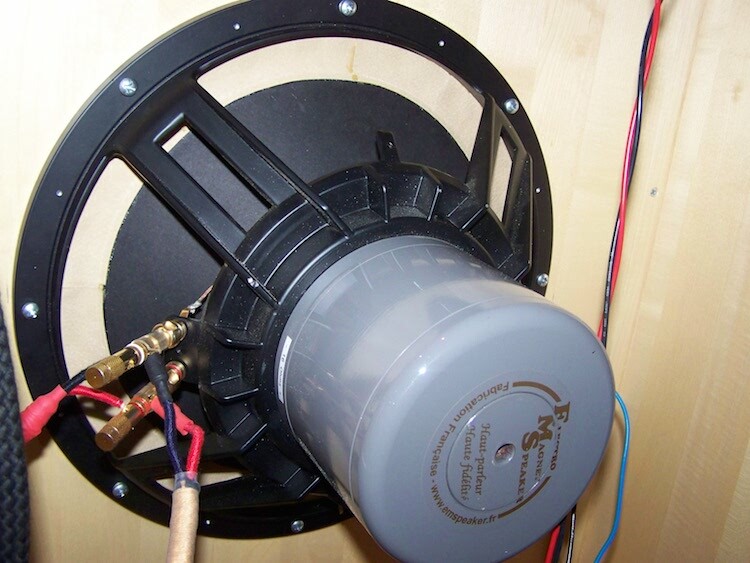 Together they create the most intriguing speaker systems. This companionship can be divided in areas of expertise: Cees´ expertise is in electronics and modifying EMS units and Hans´ expertise is woodworking. Cees is an adept of the early Western Electric designs and Tamura products where Hans has knowledge and skills with all kinds of exotic (tone)woods. Both are addicted to live (classical) music which they attend to very often. Together they spend many, many hours in listening and perfecting their designs to the speed (or attack) and tonal correctness of live music. Especially the speed or attack is where live music differs from replayed music. Together they have more than 110 years experience which they put into practice. The visit was about their works and this report is a homage to their achievements. First let´s have a look at the modified EMS field coil units. Cees did a miraculously job in modifying these. One of the modifications is replacing the paper fabric spiders by thin plywood spiders. 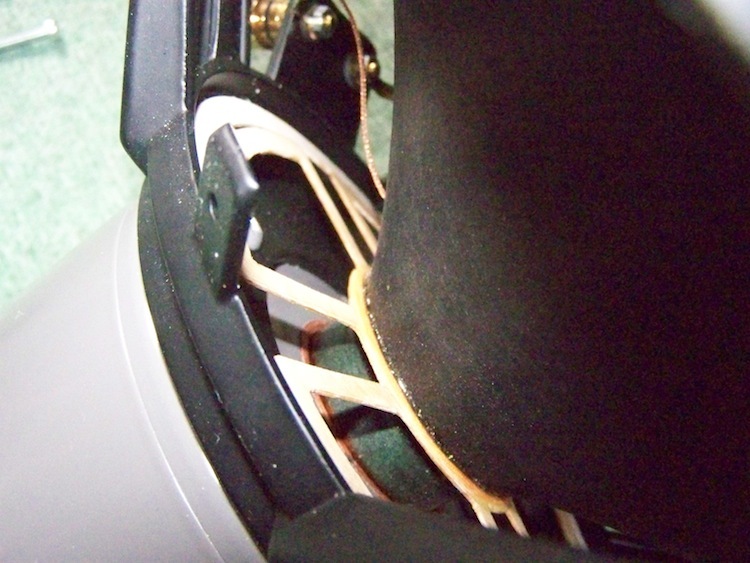 This results in a somewhat more stiffer suspension behaviour of the speaker cone. 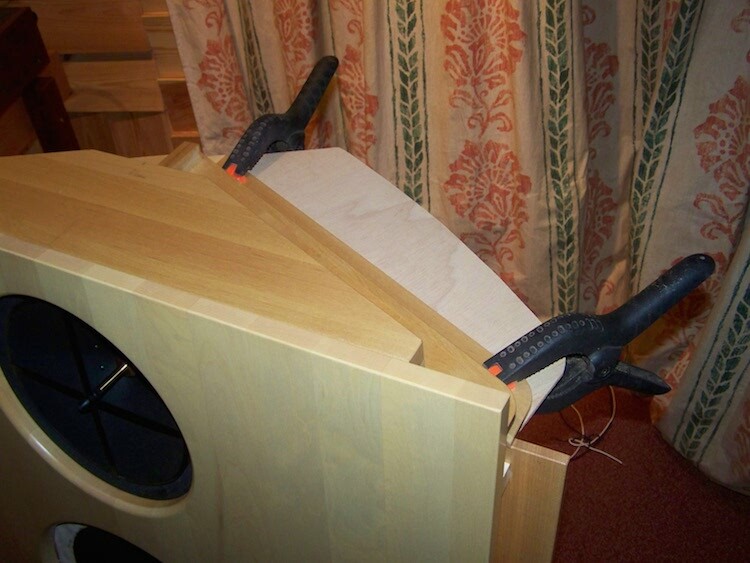 Also the speaker cone surrounds are removed or replaced, depending on the function of the unit. When the units are meant to reproduce higher frequencies the surrounds are removed, for the lower frequencies they are replaced with flexible goat leather. 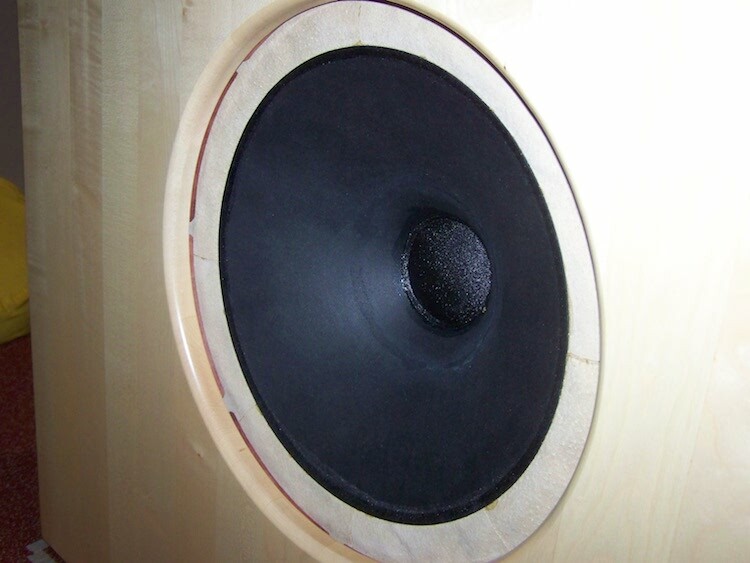 Leaving out the surrounds almost transforms the LB12EX unit into a midrange/tweeter. 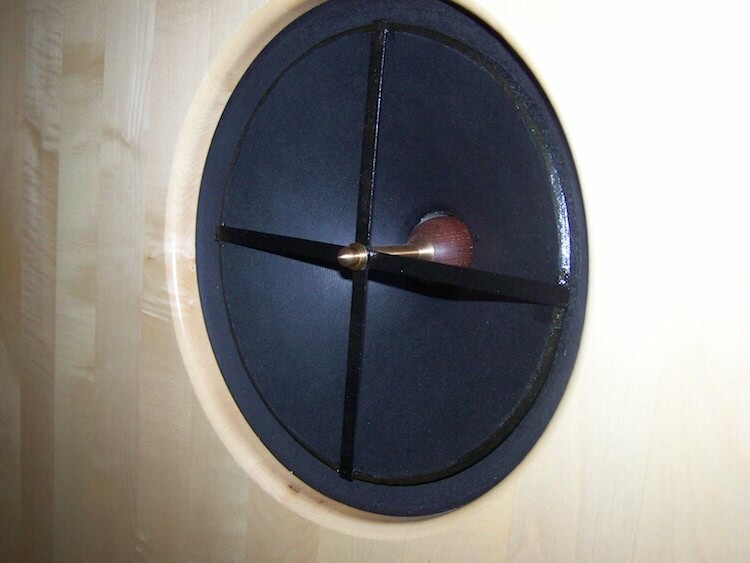 A wooden spidered, surroundless 30cm LB12EX reproduces mid and high frequencies in such a way that there is no need for a separate tweeter. During an earlier visit I was measuring the frequency response together with Olav AudioFixer and we were amazed because the measurements did not confirm our auditive experience. Probably there is more to human perception than measurments can reveal? 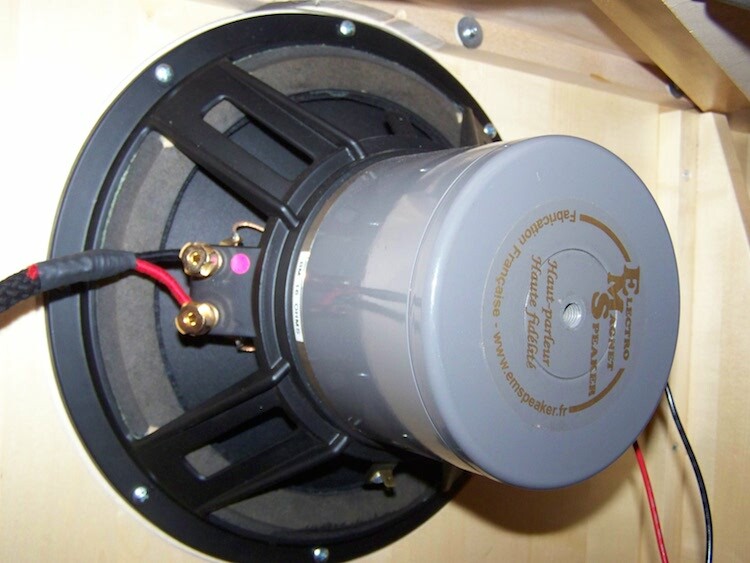 For the lower frequencies coupling with the baffle is a necessaty so the B15EX´s paper surrounds are replaced with very flexible leather. Together with the wooden spider modification, impulse behaviour is much improved. Also no filtering has been applied. Optimal alignment was achieved by adjusting the fieldcoil voltage of both units. Oh, just want to mention that Michel and Catherine Fertin of EMS have visited Musical Affairs, auditioned the modified units and support the odyssee of Cees and Hans..
Back of the modified B15EX..
Back of the modified LB12EX.. The Open Baffle with the modified EMS units.